Jason Witten (born 6 May 1982 in Elizabethton, Tennessee), is an American football player. He is a NFL Tight End for the Dallas Cowboys, drafted in 2003. As of 2017 Witten ranks second all-time in career receptions and receiving yards by an NFL tight end, trailing Tony Gonzalez. 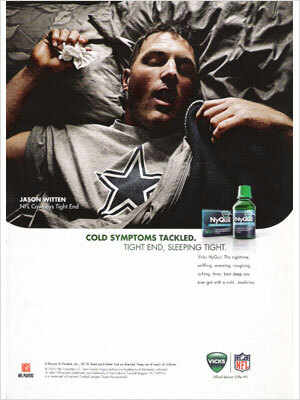 Jason Witten is featured in the 2011 NyQuil ad campaign.